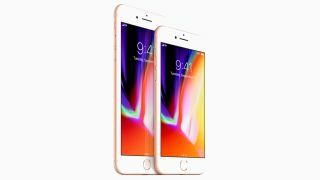 Apple announced the iPhone 8, iPhone 8 Plus and the iPhone X earlier this week and while there was no mention of the battery specs inside the phones a new report claims two of the devices will feature a downgraded battery compared to the previous generation. The iPhone 8 will reportedly have a 1,821mAh battery while the iPhone 8 Plus will have a 2,675mAh cell inside. That's down from the iPhone 7 and iPhone 7 Plus that had 1,960mAh and 2,900mAh batteries respectively, a decrease of 7% and 7.8% respectively. This is all according to TENAA, which is a certification authority in China that has Apple's specs before the phone's release. Despite having smaller batteries, the iPhone 8 and iPhone 8 Plus are actually 0.2mm thicker than their predecessors and each weigh 10g and 20g more than the phones before them. Apple must be confident in the efficiency of the new A11 Bionic processor that's included on both the iPhone 8 and iPhone 8 Plus to be able to include the smaller battery capacities on these new devices. The A11 Bionic is a 10nm processor while the A10 used in the iPhone 7 range was a 16nm chip - not to mention Apple's new and improved GPU tech in the iPhone 8 and Plus - so it would make sense if the new tech inside the new devices is much more efficient and therefore offer a similar battery life. What isn't yet clear is what battery size will be included in the iPhone X. At 7.7mm thick it's four millimeters thicker than the iPhone 8 range so it'd make sense if the company has included a slightly bigger battery, but we'll have to wait for future teardown reports to know for certain.